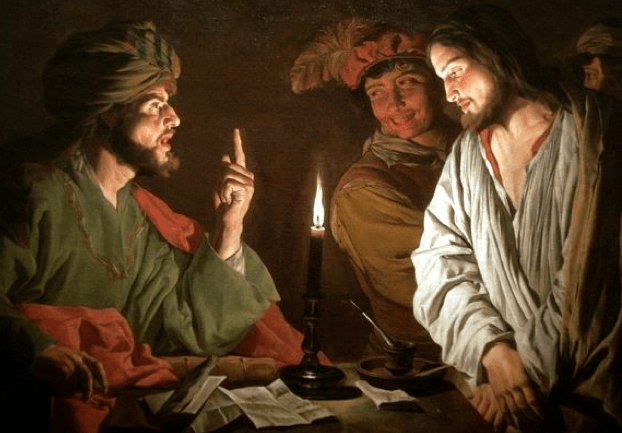 Part II: Who Rejected Jesus? When Jesus entered Jerusalem and made his rightful claim to be the Messianic King, he set into motion the events that he knew would lead to his death. He was wildly popular with the people, which caused the religious leaders to fear that all the people would follow him (John 11:48). They were obligated to squash all rebellion and keep the peace so that the Romans would allow them to keep their positions of power. Moreover, by challenging the corrupt Temple “racket” of the house of Annas, Jesus was bringing the wrath of the powerful priestly syndicate down on his head. The religious leaders couldn’t touch him when he was surrounded by large crowds of followers, but they wanted to end his life. They needed someone who knew how to find him at night when he was in his secluded camp outside the city, away from the crowds. Choosing the night of Passover was a perfect scheme, because every religious Jew would be celebrating the Passover meal that started at sundown. The feast usually continued late into the night, and most people would immediately go to bed after having a large meal with several cups of wine. The streets would be deserted of the throngs that had come for the feast, and it would be easy for Judas to lead the soldiers to where they could seize Jesus. The arrest and trial of Jesus occurred in the wee hours when the whole city was asleep, except for Jesus’ enemies who needed to convict him before the crowds heard about it. Who Rejected Jesus, and Who Didn’t? An important conclusion for us is that the people who called for Jesus’ crucifixion were not the same crowd as those who hailed him as Messiah the week before! The council that met at such a late hour on a major holiday for a hasty conviction was certainly not the seventy elders of the Sanhedrin, but a quickly assembled group of sympathizers. The mob that gathered early in the morning to shout “crucify” consisted of the Sadducean priests, the elders and their supporters. They were the ones who demanded that Jesus be crucified and Barabbas released, because Jesus had offended them by denouncing their corruption. Later, at the time of the first Temple service of the day, large crowds fill the streets, only now discovering that Jesus has already been condemned to death (Luke 23:27). They were the ones who follow him to the cross and mourn for his death. Those who taunted him were the priests and Roman soldiers. Jesus was as popular with the masses at his death as he was one week earlier! By knowing more about the issues and populations within first century Judaism, we can see that those responsible for his death were a few of those in power who saw his kingship as a threat to their own corrupt empires. We should therefore read the words in the New Testament about the “Jewish rejection of Jesus” as wondering why every single Jew did not believe in him, rather than that the people as a whole rejected him. Within a hundred years the church would become largely Gentile, but the early church was almost entirely Jewish for several years. 1 David Stern, Jewish New Testament Commentary (Clarksville, MD: Jewish New Testament Publications 1992), 9. 2 Shmuel Safrai, as quoted by Dwight Pryor in the lecture series, Misconceptions about Jesus and the Passover (available at JCstudies.com). Thank you thank you thank you for addressing the popular sermon topic of Palm Sunday that the same crowd who welcomed Him was the same one who cried crucify Him. This is such a necessary correction to the way the passion story is read. The wealthy and corrupt leaders of the temple were the ones conspiring against Jesus, working with Judas the traitor to trap Jesus at night when his supporters could not be present to object. Our church choir is performing a Holy Week cantata that implies that the crowd that welcomed Jesus on his triumphal entrance into Jerusalem was the same crowd that called for his crucifixion. [cringe] Unfortunately such wrong thinking keeps anti-semitism going. Lamentable. There are 2 numbered footnotes, but the article uses a superscript of 1 twice, you might want to fix this typo. I also think that one can show by comparison with the same story in the other 3 gospels that John uses the term “the Jews” to refer to Jewish leaders. But I was not able to do this and my synopsis of the gospels is packed. Thank-you so much for this clarification! This site is wonderful! I’m Jewish and a new believer in Jesus. I’ve been reading the gospels and searching the Internet for answers to Bible questions and your site came up in response to another question I had. So I’ve just been reading through your articles. I kept thinking about how the people had already welcomed Him and knew He was the Messiah and they had seen Him heal and then they gleefully called for His blood a week later! That seemed incomprehensible. I thought it just had to do with the hardened hearts of all the Jews that occurred at that moment so that the scripture could be fulfilled. Anyway, this makes so much sense, they were different groups of Jews, the latter group who called to crucify Him being the supporters of their corrupt and envious leaders (chief priests, Sadducees and Pharisees). Part 1 is great too, the historical background is important to understand the corruption of the temple sellers and why Jesus was so angry at them. Great site, great articles, thanks!